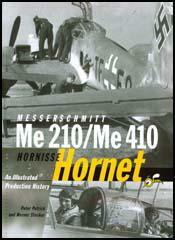 The Messerschmitt Bf 109 was designed by Willy Messerschmitt and Walter Rethel and had its first test flight in 1935. The all-metal aircraft had a closed cockpit and a retractable under-carriage. It was initially powered by a Rolls-Royce Kestrel V engine. It had a maximum speed of 342 mph (550 km) and had a range of 410 miles (660 km). It was 28 ft 4 in (8.65 m) long with a wingspan of 32 ft 4 in (9.87 m). The aircraft was armed with 2 machine-guns and 2 20 mm cannons. At the International Air Show in Zurich in July 1937, the BF 109 with a modified engine, set a world record of 379.39 mph. Until the Battle of Britain the BF 109 was considered the best fighter aircraft in the world. The BF 109, like its main rival, the Supermarine Spitfire, was continually improved throughout the Second World War. Messerschmitt A. G. produced over 35,000 for the Luftwaffe between 1936 and 1945. By John Simkin (john@spartacus-educational.com) © September 1997 (updated December 2014). Germany's new Messerschmidt aeroplanes have been tested in the Spanish civil war. The pilots are pledged before they leave Germany never to let their planes fall into the hands of the enemy. Each pilot has orders to set fire to his plane if it is brought down or has to make a forced landing on enemy soil. Each plane has a special tank of inflammable matter that can be ignited at once for this purpose. The German pilots in Spain are used more in combined infantry and air attacks than in air raids, which are chiefly carried out by the Italians. The German military experts are particularly interested in developing the art of offensive operation by all arms combined, the air arm included, and Spain is proving to be a valuable experimental field. They are of opinion that the decisive blow in future wars will be delivered by combined operations of this kind. (3) After being involved in a dogfight with a German pilot Alan Deere wrote a report on the relative merits of the Spitfire, Hawker Hurricane, and Messerschmitt Bf109. In my written report on the combat I stated that in my opinion the Spitfire was superior overall to the Me 109, except in the initial climb and dive; however this was an opinion contrary to the belief of the so-called experts. Their judgement was of course based on intelligence assessments and the performance of the 109 in combat with the Hurricane in France. In fact, the Hurricane, though vastly more manoeuvrable than either the Spitfire or the Me 109, was so sadly lacking in speed and rate of climb, that its too-short combat experience against the 109 was not a valid yardstick for comparison. The Spitfire, however, possessed these two attributes to such a degree that, coupled with a better rate of turn than the Me 109, it had the edge overall in combat. There may have been scepticism by some about my claim for the Spitfire, but I had no doubts on the score; nor did my fellow pilots in 54 Squadron. Later events, particularly in the Battle of Britain, were to prove me right. Two Hurricane pilots on patrol over the South-East Coast yesterday, afternoon ran into six of the new Messerschmitts 109F, Germany's latest fighter, and after damaging two of them sent all six packing back to France. Both the Hurricanes landed safely. One of the pilots said: "We were just off the South coast when we saw the six Germans coming towards us. They were the new Me 109F. We kept straight on. The last of the six turned out to attack me and I squirted at him. Immediately the enemy plane went up into the clouds and tried to nip round on to our tails. Then began a terrific dogfight which lasted for ten minutes, during which I fired at two. One of them dived and waffled away at a low altitude and the other poured out black smoke. During the fight we were hard pressed, but this was not due to any advantage in the German machines but to the fact that we were two against six." This is the first official news of the German fighters, although they have taken part in recent daylight sweeps across the Channel. The new Messerschmitts, designed to operate in the rarefied atmosphere found above 30,000 feet, are said to have a top speed of 380 miles an hour. Having sacrificed heavy armament to attain supremacy in high-altitude flying, the machine has been equipped with only one cannon firing through the airscrew and two machine-guns. The Hurricane (Mark 2), with probably greater speed than the new German fighter carries superior armament consisting of the usual eight guns or cannon.